CCBoot Personal Disk is used to store client’s data which is not lost even when you reboot the client. 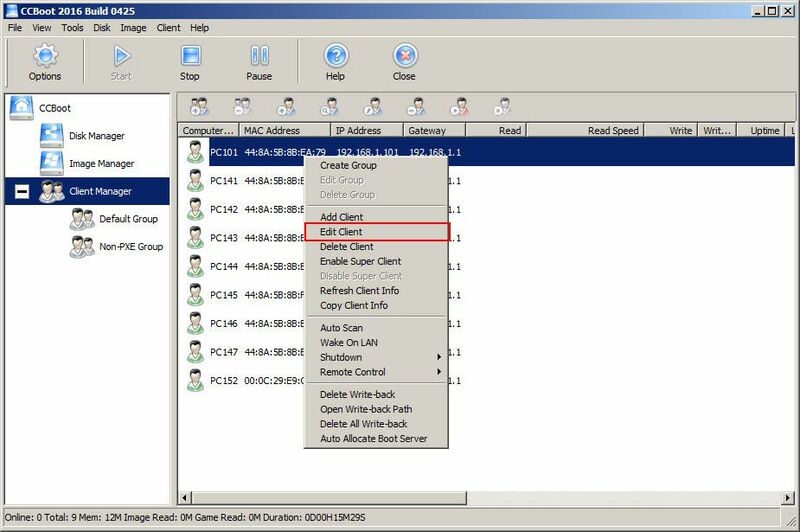 This function is used in the enterprise widely and compliments game centers to store users save games as well. Important: Once you have enabled "Personal Disk" you need to boot the client in super mode once to let it properly be recognized in the Windows OS. 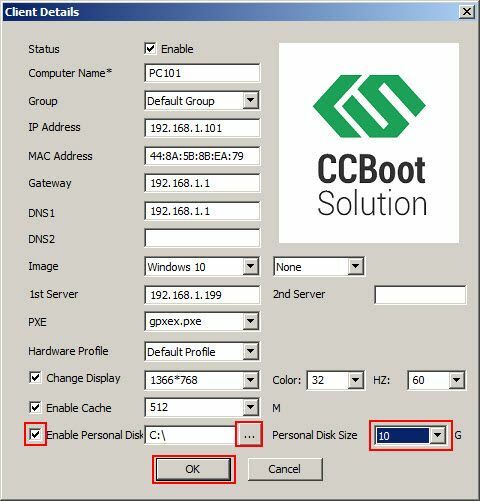 We assume that you have installed CCboot and finished making the boot image, and assume that you are already very familiar with CCBoot’s basic operation and settings, with PC101 as example, the settings of personal disk is as below. 1) On CCBoot main interface, click on “Client Manager” and right click PC101 and choose “Edit Client”. 2) In “Client Details” dialog box, check the “Enable Personal Disk” check box, then click the "..." button right beside the “Input Box” to browse for the location to store personal disks. Click the "Personal Disk Size" drop down and choose desired Personal Disk size. In this case 10 G (Figure 1-1). Notes: After you set the personal size, you cannot change it any more. You will have to uncheck the "Enable Personal Disk", then delete the personal disk file. After that you can reset personal disk of you require size. Note: Use a separate disk for personal disk, do not user other disks as personal disk location. From CCBoot version 20151008, personal disk function has been optimized and does not need to initialize in the client PC. But you still have to run the client once in superclient mode to set everything up. 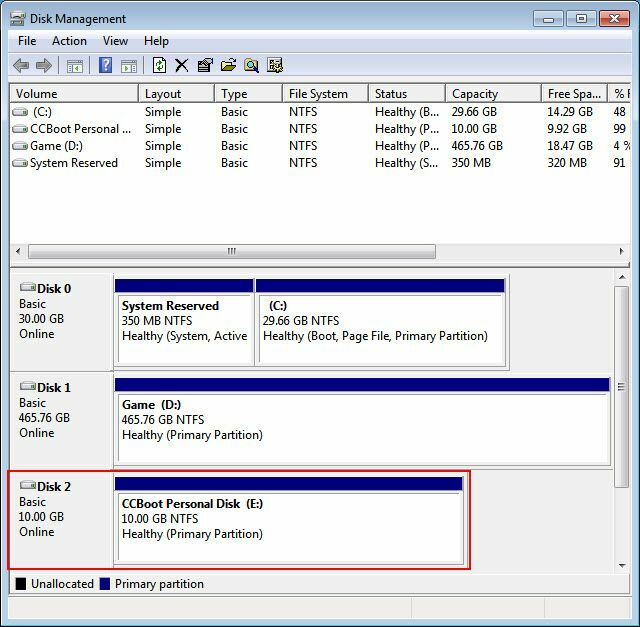 Boot "PC101", open Disk Management, and check the “Personal Disk” disk is initialized properly or not (Figure 1-2). 3) On the desktop, double click on Computer or My Computer and you will see there are 3 disks there. E: is the personal disk you have just created. That is the drive to keep your personal files and your files won’t be lost even you reboot your client. Note: When you define the "Personal Disk" save location, make sure that it have enough free spaces. If the personal disk storage drive is not big enough it will create issues in client PC, like not able to boot, file corruption on server etc. 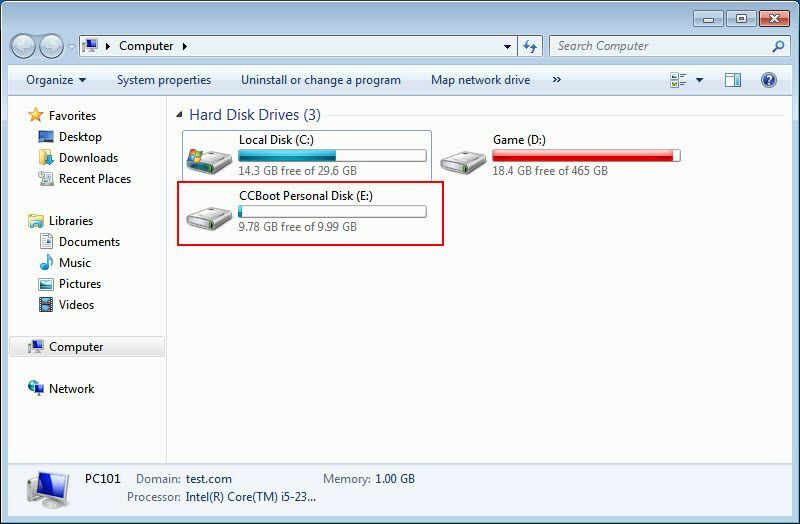 So, use the biggest disk you can find for the personal disk storage or make sure that you set personal disk size as small that can be used (smallest is 10 GB). Note: Keep in mind that you should not use any disk used in CCBoot disk manager for personal disk storage. So, image disk, writeback disk, game disk or SSD disks should not be used for personal disk storage.